What is Pantoprazole 40 mg? Pantoprazole sodium sesquihydrate is an off-white crystalline powder which has slight basic and acidic chemical properties. It is easily soluble in water, very slightly soluble in phosphate and practically insoluble in n-hexane. Pantoprazole is available in one strength (40 mg) tablet. As a delayed-release tablet it comes in 20 mg and 40 mg strengths. 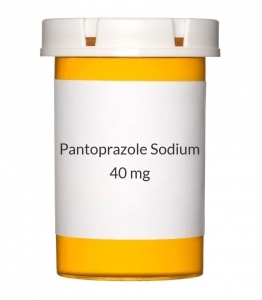 What is Pantoprazole 40 mg used for? As mentioned above, Pantoprazole is used in the treatment of gastroesophageal reflux disease (GERD). In this condition, a backward movement of acid from the stomach causes heartburn and might cause damage to the esophagus (the tube between the throat and the stomach). It is used when the stomach starts producing excessive acid, such as in Zollinger-Ellison syndrome. Pantoprazole works by lowering the amount of acid in the stomach. How to Use Pantoprazole 40 mg? As a delayed-release tablet or oral suspension, pantoprazole is intended to be taken orally. Delayed release tablet refers to the property of releasing medication in the intestine. This is to prevent breakdown of the medication by the stomach acids. In case of delayed-release oral suspension, it's the liquid that releases the medicine and performs the same function. The delayed-release granules for oral suspension are usually mixed with apple juice or apple sauce and consumed via the mouth or given through a feeding tube. The tablets can be consumed once or twice a day, with or without food. The oral suspension, on the other hand, needs to be taken nearly 30 minutes before a meal, once or twice a day. It is advisable that you take pantoprazole at the same time, everyday. Although these directions are quite common, patients are strongly recommended to consult their doctor before use. How to Take the Tablets: The tablets are meant to be swallowed whole, do not divide them into smaller pieces. Do not chew or crush them. If you've been prescribed the 40 mg tablets and you find it too big to swallow, ask your doctor to give you the 20 mg tablet instead. How to Take the Oral Suspension: As for the oral suspension granules, mix these up with one teaspoonful of apple juice. Do not mix it with water or any other liquid. All the granules in the pack are meant to be used in one dose, therefore do not try to split them into smaller doses. Pantoprazole granules mixed with apple juice can also be given through a feeding tube, though you are advised to consult your doctor. Pantoprazole 40 mg, like any other medicine, has the tendency to cause side effects. If a Pantoprazole user experiences difficulty in breathing, hives, swelling of the face, lips or throat, they are advised to contact their doctor immediately. It is important to understand the severity of these symptoms. The medicine may also cause other side effects. If you have a severe reaction to the medicine, you are strongly advised to discontinue use and get in touch with your doctor immediately. USES: Pantoprazole is used to treat certain stomach and esophagus problems (such as acid reflux). It works by decreasing the amount of acid your stomach makes. This medication relieves symptoms such as heartburn, difficulty swallowing, and persistent cough. It helps heal acid damage to the stomach and esophagus, helps prevent ulcers, and may help prevent cancer of the esophagus. Pantoprazole belongs to a class of drugs known as proton pump inhibitors (PPIs). OTHER USES: This section contains uses of this drug that are not listed in the approved US professional labeling for the drug but that may be prescribed by your health care professional. Use this drug for a condition that is listed in this section only if it has been so prescribed by your health care professional. This medication may also be used to treat and prevent stomach and intestinal ulcers. HOW TO USE: Read the Patient Information Leaflet if available from your pharmacist before you start taking pantoprazole and each time you get a refill. If you have any questions, ask your doctor or pharmacist. Take this medication by mouth as directed by your doctor, usually once daily. Dosage and length of treatment are based on your medical condition and response to treatment. If you are taking the tablets, you may take them with or without food. Swallow the tablets whole. Do not split, crush, or chew the medication. Doing so may destroy the drug. If you are taking the granules, take your dose 30 minutes before a meal. To take it by mouth, open the packet and mix the granules in applesauce or apple juice. Do not mix with other foods or liquids. Do not crush or chew the granules. Sprinkle the granules on 1 teaspoon (5 milliliters) of applesauce and swallow all of the mixture right away (within 10 minutes). Follow with sips of water. Or you can mix the granules with 1 teaspoon (5 milliliters) of apple juice in a small cup, stir for 5 seconds, and swallow all of the mixture right away. To make sure you take the entire dose, rinse the cup once or twice with apple juice to mix any remaining granules, and swallow the juice. Do not prepare the mixture ahead of time for later use. If you are giving the granules through a tube into the stomach (nasogastric or gastric tube), ask your health care professional for detailed instructions on how to properly mix and give it. If needed, antacids may be taken along with this medication. If you are also taking sucralfate, take pantoprazole at least 30 minutes before sucralfate. Use this medication regularly to get the most benefit from it. To help you remember, take it at the same time each day. Continue to take this medication for the prescribed length of treatment even if you are feeling better. Tell your doctor if your condition persists or worsens. SIDE EFFECTS: Headache or diarrhea may occur. If any of these effects persist or worsen, tell your doctor or pharmacist promptly. Remember that your doctor has prescribed this medication because he or she has judged that the benefit to you is greater than the risk of side effects. Many people using this medication do not have serious side effects. Tell your doctor right away if you have any serious side effects, including: symptoms of a low magnesium blood level (such as unusually fast/slow/irregular heartbeat, persistent muscle spasms, seizures). This medication may rarely cause a severe intestinal condition (Clostridium difficile-associated diarrhea) due to a type of bacteria. Do not use anti-diarrhea products or narcotic pain medications if you have any of the following symptoms because these products may make them worse. Tell your doctor right away if you develop: persistent diarrhea, abdominal or stomach pain/cramping, fever, blood/mucus in your stool. A very serious allergic reaction to this drug is rare. However, get medical help right away if you notice any symptoms of a serious allergic reaction, including: rash, itching/swelling (especially of the face/tongue/throat), severe dizziness, trouble breathing. This is not a complete list of possible side effects. If you notice other effects not listed above, contact your doctor or pharmacist. In the US - Call your doctor for medical advice about side effects. You may report side effects to FDA at 1-800-FDA-1088. In Canada - Call your doctor for medical advice about side effects. You may report side effects to Health Canada at 1-866-234-2345. PRECAUTIONS: Before taking pantoprazole, tell your doctor or pharmacist if you are allergic to it; or to similar drugs (such as lansoprazole, omeprazole); or if you have any other allergies. This product may contain inactive ingredients, which can cause allergic reactions or other problems. Talk to your pharmacist for more details. Before using this medication, tell your doctor or pharmacist your medical history, especially of: liver disease. Some symptoms may actually be signs of a more serious condition. Tell your doctor immediately if you have: heartburn with lightheadedness/sweating/dizziness, chest pain or shoulder pain (especially with trouble breathing, sweating, lightheadedness, pain spreading to arms/jaw/neck/shoulders), unexplained weight loss. Proton pump inhibitors (such as pantoprazole) may increase your risk for bone fractures, especially with longer use, higher doses, and in older adults. Talk with your doctor or pharmacist about ways to prevent bone loss/fracture, such as by taking calcium (such as calcium citrate) and vitamin D supplements. Before having surgery, tell your doctor or dentist about all the products you use (including prescription drugs, nonprescription drugs, and herbal products). During pregnancy, this medication should be used only when clearly needed. Discuss the risks and benefits with your doctor. This medication passes into breast milk. Consult your doctor before breast-feeding. DRUG INTERACTIONS: See also How to Use section. Drug interactions may change how your medications work or increase your risk for serious side effects. This document does not contain all possible drug interactions. Keep a list of all the products you use (including prescription/nonprescription drugs and herbal products) and share it with your doctor and pharmacist. Do not start, stop, or change the dosage of any medicines without your doctor's approval. A product that may interact with this drug is: methotrexate (especially high-dose treatment). Some products need stomach acid so that the body can absorb them properly. Pantoprazole decreases stomach acid, so it may change how well these products work. Some affected products include amphetamines, ampicillin, atazanavir, erlotinib, nelfinavir, rilpivirine, certain azole antifungals (itraconazole, ketoconazole, posaconazole), among others. This medication may interfere with certain laboratory tests (including urine test for tetrahydrocannabinol-THC), possibly causing false test results. Make sure laboratory personnel and all your doctors know you use this drug. NOTES: Do not share this medication with others. If your doctor instructs you to use this medication regularly for a long time, laboratory and medical tests (such as a magnesium blood test) may be performed periodically to monitor your progress or check for side effects. Keep all regular medical and laboratory appointments.